I rarely find a new and interesting toy that I feel I want to buy for our dogs. Don't get me wrong, I buy TONS of toys, but often because they're cute and it makes the dogs (mostly Murray) happy, which makes me happy. I have recently come across one ball that we do not yet own and I think would be a fun ball to use in the yard or a field for some added exercise....which we need! 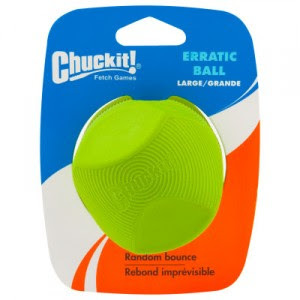 It's a ball that bounces "erratically" when you throw it so your dog cannot exactly gauge where it will land. My boys like to chase things, so having a ball to chase in different directions seems right up their alley! It comes in three different sizes...small, medium and large, and the smaller ones fit their launchers that they also sell. I am looking to buy the large one without a launcher. When I pick it up and try it out, I will report back with what we thought. I'm sure that the ball would land under a couch or behind a dresser around here and it would be weeks before we found it again. Lost toys are proportional to the amount we spend for them. Mom's laughing at Jan's comment, that's so true for us too! My toys are always disappearing, usually under the couch or between the cushions. Looks like a fun ball, great for the backyard! It's true in our house too! It always amazes me when we move a piece of furniture or go under for cleaning..the dogs get so excited to see old toys! I has seen dat bal but I had much druther chase me some squirrels or chimi=unks...and it's FREE...hehehe. You like my accent you say, I is from da south. I guess you figured dat out huh?